Chastity and modesty… avoiding girls until developing a character worthy of becoming a husband and father. That value system was being uprooted in the late 19th and early 20th centuries as Native Americans were moved onto reservations, sent to Indian schools, and pressured to adopt Euroamerican customs and values that (arguably) were not so noble. It was a difficult transition, cutting deep emotional wounds, as I learned while immersing myself in the life of Eugene Standingbear. Special thanks to the American Horse family, especially the Chief’s grandson Joe American Horse, now 84, who provided details to fill some holes in this article. But first, as they got settled into their new life, Laura’s daughter died, leaving her five children in the care of Laura and her son Eugene, who suddenly had to support the family. At age 16 he got into the booming fencepost business while barbed wire was slashing scar after scar across the western landscape. Eugene drove a horse-drawn wagon at dawn along the creek to a thicket of ash trees, where he cut poles six ax-handles long… long enough for two fenceposts. In late afternoon he hauled the poles to the general store at Red Rock, South Dakota, and traded them for food and clothing. Heading home around nightfall on crisp, winter evenings, the wagon bed loaded down with groceries, Eugene was lulled by the rattling of stanchion chains, the jangling of small harness chains, and the clip-clop of the shod, trotting horses. Dogs barked as his music floated along the dark, frozen creek. 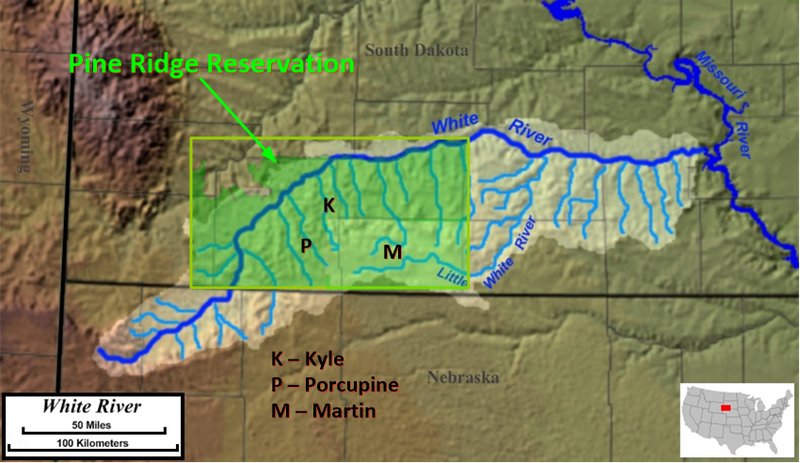 The big White River branched off the Missouri and twisted westward through Pine Ridge, where it connected with a dozen smaller, parallel creeks that covered the reservation like a wide-tooth comb. Eugene lived with his mother and five nieces and nephews in a small log cabin along American Horse Creek south of Kyle, a mile north of the family of the venerable Chief American Horse. He was one of two Lakota chiefs named American Horse during a crucial period a half-century earlier (1860-80), when gold was discovered in the Rocky Mountains and attracted a locust plague of white men who uprooted and destroyed nearly everything that the Plains Indians held sacred… the open plains, the hunting grounds, the buffalo herds…. American Horse #1 was a principal war chief who fought bravely and closely with Chief Crazy Horse to try to fend off the white plague. He died during one brutal battle in 1876. By then it was apparent to most Plains Indians that the war against the white men was lost… and the next generation would have to take a new approach. American Horse #2, while also a brave fighter and skilled horse catcher, represented the younger generation of “peace chiefs” who had another set of skills: negotiating and peacemaking. According to some reports, he acquired the name American Horse at age 36, shortly after the death of American Horse #1. Other reports say he got the name at age 18. In either case, the two leaders—the war chief and the peace chief—both fought for the survival of their people. Red Dog, Little Wound, John Bridgeman (interpreter), Red Cloud, American Horse #2, and Red Shirt, in Washington, DC, in the summer of 1880. American Horse #1 (1830-1876) was the brother of Chief Red Cloud, another great Lakota leader, and a contemporary of Eugene’s grandfather George Standing Bear (1829-1908). American Horse #2 (1840-1908) married the daughter of Chief Red Cloud (and was still alive when Eugene was born). Did American Horse #1 share a blood kinship with American Horse #2, besides being his uncle-in-law? Maybe or maybe not… but that’s not really important if you believe that genetics usually* takes a back seat to spiritual kinship. The two American Horse chiefs probably shared a warm and respectful nephew-uncle bond in the one-step-closer Lakota tradition. According to family stories passed down the generations, the young man who would become American Horse #2, while still in his teens, developed a reputation as an expert horse catcher. Three centuries earlier, European sailors had brought horses along on their wooden sailing ships when they came to explore America… but they had to be small horses because space was limited. So by the 1800s, America was flourishing with those little horses, sometimes called Indian ponies. The US soldiers, though, rode big, powerful horses… today’s equivalent of a mix between a Maserati and a Dodge Ram half-ton pickup truck. So while the white man was freeing the Native Americans of their lands and their heritage, the Native Americans took every opportunity to free the white men of their big horses. Apparently our young Lakota warrior had a special gift with horses and earned the name Milahanska Tasunke Icu Tiospaye, translated as He Took Longknife (Cavalry) Horses. He soon counted enough coup and displayed enough leadership qualities to be named a chief of his clan. So as a young man, Chief American Horse #2 had five wives and lots of kids. Large families like that, for the more capable and revered men in Lakota clans, were apparently considered normal and traditional across the generations… an accepted, practical way of life. Tribal property was considered communal property, so that the entire tribe prospered together in good times or suffered together through bad times. And the clan of Chief American Horse #2 had a growing herd of big horses. Calling traditional tribes “close-knit” would probably be an understatement. Relationships among tribal members were like relationships among Euroamerican family members. 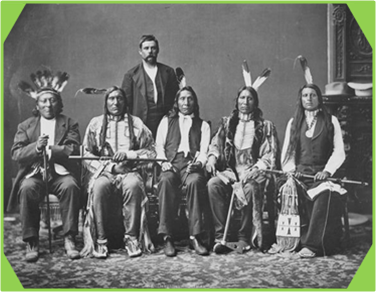 According to Joe American Horse, who currently lives at Pine Ridge, his family (pictured here 15 years or so after the Dawes Act) included the Chief (front and center); two of his wives next to him, Josie (l) and Sleep (r); “Aunt Millie” next to Sleep; two of his sons (back row, l-r) Charles (Joe’s dad) and Thomas (the eldest son of Chief American Horse); and Thomas’s son William. 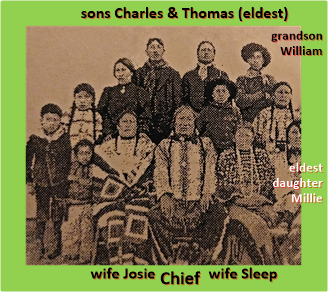 Sleep is the mother to Charles and grandmother to Joe. There were quite a number of other sons and daughters, some of whom will be mentioned below. But in 1887 that all changed. The Dawes Act was passed in Washington and decreed that Native American communal living would have to be replaced by private ownership in the capitalist, Euroamerican tradition, and all tribal customs such as polygamy would be outlawed. Suddenly the last vestiges of the Native American way of life were swept away by a single act of Congress. In effect, at age 47, Chief American Horse was told by Uncle Sam that he’d have to dismantle his family and abandon four of his wives. It was a heart-breaking time for the American Horse family (as it was for many Native American families). After long discussions and probably some grieving, the family decided the best they could do was to compromise with Uncle Sam. Three of his wives insisted on staying with the Chief as his wives, and a fourth decided (no doubt with some reluctance) to leave the family… and also to leave behind her children to be raised by the Chief’s surviving family. 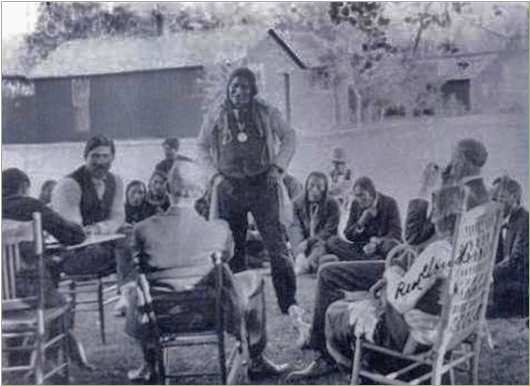 Chief American Horse #2 (standing) negotiates in friendship and good will, 15 years after the Dawes Act, as his father-in-law Chief Red Cloud (sitting, lower right) looks on. Lakota Tribal Council, Pine Ridge, South Dakota, 1903. In recent years Joe and Vern American Horse recalled family stories of their grandfather, Chief American Horse #2, as a peacemaker of legendary proportion. Whether it was bickering among brothers and cousins, or blood feuds between clans, or the cataclysm between Native America and Euroamerica, Chief American Horse #2 always knew instinctively what to say and do… how to make everyone laugh and relax… how to diffuse conflict. Few Native American men worked harder to sustain peace and happiness among their people during those difficult years after the Dawes Act. By the time teenager Eugene and his mother Laura returned to Pine Ridge, Chief American Horse was an old man… a venerable leader of his people with waning responsibilities and a weary heart from the injustices that he and his people had endured. Eugene recalled his teenage years in the 1920s, when his neighbor, the chief’s son Ben American Horse, was a policeman on the reservation. Ben had been one of the first students at Carlisle Indian school and a Wild Wester (like Eugene’s father, Luther Standing Bear). Now Ben stood six-foot-six, all bone and muscle. He packed a pair of pistols with notches carved all over the handles. Some folks thought the notches might represent shooting deaths, but Ben never talked about them, so no one knew for sure. Ben’s best friend was his brother-in-law, Ben Chief, another larger-than-life Lakota man. The two big Bens were often seen together on the reservation, an imposing sight. Early one winter morning in 1922 the two Bens climbed into their old Ford truck and drove through a blizzard to notify their neighbors of the death of Chief American Horse. Entering Eugene’s cabin in mid-afternoon, they removed their heavy fur coats, shook the snow off, and told Eugene’s mother the news. The three began mourning—crying hard for about 30 minutes. The five youngsters gathered close around Eugene, who wrapped his arms around them as sadness settled over the house. It was a great honor for Eugene. Chief American Horse and his family might have announced his death in 1908 or 1910, even though the Chief actually lived quietly and peacefully for another 14 years. There were still hard feelings and broken hearts among Native Americans in the early 1900s after their heritage had been stripped away by the Dawes Act… after Uncle Sam had denounced their beloved way of life as “unlawful”… and after mines, towns, and railroads of the “white locusts” had already spoiled much of their homeland under the watchful eyes of Uncle Sam. If you or I had been a Native American leader at the time we might have wanted to live our final years in peace beyond the view of those eyes… and telling Uncle Sam we’d died might do the trick. Mere speculation at this point. Eugene climbed into the truck with the two Bens, went to town for the materials to build a casket, and returned to the American Horse farm. The chief had been laid in a small log cabin near the main house. Eugene measured his height and shoulder size with a string, then was driven across a bridge over the creek to a large cabin where the casket would be built. Meanwhile, friends and neighbors had come from miles around to attend the services. They cleared away the two-foot snowdrifts from around the house and erected their wall tents. By nightfall Eugene was busy working across the creek from the mourners, who were singing Christian hymns translated into Lakota. Most of them could read Lakota, but not English. In the dark hours of early morning the casket was completed under the close supervision of Ben American Horse. Eugene carried it outside while Ben shouted the news to the mourners across the creek. Six young men mounted up and nudged their horses to a trot toward the cabin. As they approached, Eugene could only see the bouncing orange embers of the Bull Durham cigarettes dangling from their lips. An eerie sight… like a squadron of dancing fireflies. The riders lined up on either side of the casket and removed the ropes from their saddles. Ben slipped the ends of the ropes through the casket handles and returned them to the riders, who hoisted the casket, wrapped their ropes around their saddle horns, and moved in slow formation back over the bridge to the small cabin where Chief American Horse lay at rest. Eugene was asked to help Ben change the chief into his buckskin clothes. He’d died wearing a pair of gray Levis and an old blue shirt, looking to Eugene like an eagle that had been plucked and painted. Removing the clothes from the stiff body revealed thick, heavy ridges of scar tissue on both arms and legs and across the chest and stomach. It wasn’t unusual to see Lakota leaders with scars in the early 1900s, whether from battles against the cavalry and warring clans in the previous century, from Sun Dance ceremonies, or from slashing their arms and torsos as a sign of sacrifice for their suffering people. They managed to dress the chief in a good set of his buckskins. At dawn, while the mourners began to form a mile-long procession that would move slowly from the American Horse home to the American Horse church beside the cemetery, Eugene drove a wagon to the cemetery and picked through eight inches of frozen topsoil before reaching the soft clay below. He and three other men dug quickly in shifts and finished the grave in three hours. By the time they finished the digging and entered the church, the service was nearly over, so Eugene quietly found a seat at the back of the room. Ben American Horse was standing in the pulpit thanking friends and relatives who had come to mourn for his father. Other family members sat nearby next to trunks loaded with goods to be given away. Ben finished the eulogy, and hundreds of family possessions were given to relatives and close friends. Eugene approached the American Horse family and accepted the gift with awe… as well as some qualms. Owning these things would be a great responsibility. Returning to his seat at the back of the room, he peeked inside the bundle. It contained beaded moccasins, fur leggings, eagle feathers, a roach, arm bands, and cuffs. There were several sets of bells, both the metal type and the traditional deer-toe clackers. 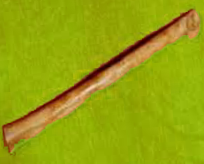 Also in the bundle was an eagle-bone whistle, a sacred, finely polished instrument used by prophets and medicine men during special ceremonies. The whistle alone was one of the greatest honors a 16-year-old Lakota boy could imagine. Eugene spent the evening feasting and visiting with friends before walking home that night. He hadn’t slept for nearly two days, and he felt like he was in a trance. It was a strange winter night anyway. Something was present in the still, dark air that he could only sense, and he started his journey with an uneasy feeling, as though he was being followed and watched. He carried the big medicine bundle over his shoulder. Off in the distance, a mile away he could see the dim glow from the lamp his mother always hung in the window at night. As the sounds of the funeral party faded and disappeared, the only sounds now were Eugene’s muffled footsteps on the snow-covered path and the occasional barking of a several far-off dogs, who also seemed to sense the strange energy in the winter air. Eugene couldn’t take his mind off the sacred bundle, especially the eagle-bone whistle. Halfway home he gave in to an overpowering urge to open the bundle and dig out the sacred whistle. He stopped and studied it in the moonlight. He knew it should be used only in special ceremonies, but he couldn’t resist. He brought it to his lips and blew. The shrill note split the night… then all was still. Even the dogs fell silent. As Eugene quickly replaced the whistle and closed up the bundle, a sudden gust of wind rustled a patch of tall grass jutting up through the snow just ahead of him… and he froze. The gust swept toward him, disturbing all of the clumps of grass around him, then it circled and hit him from behind, making his pant-legs flutter… and he began to walk quickly. The gust swept around him in a circle and hit him again from behind… and he broke into a trot. Again and again, like a whirlwind, the gust created circles in the grass and kept pushing Eugene toward home as he dashed the last half-mile. He stormed through the yard and grabbed the door latch. As usual, it was locked, so he pounded on the door and waited desperately for his mother to open it. A few seconds seemed like an hour as the wind swept the face of the cabin and crowded the boy against the doorway. He launched himself from the porch and dashed one lap around the cabin, returning just in time to see a sliver of light cut through the darkness as the door opened. He dove into the kitchen, landing on his hands and knees as the bundle went sliding across the floor. She told Eugene to go to the barn and get the longest teepee pole while she fixed a plate of fry bread, meat, and soup in the kitchen. When her son returned to the house she tied all the clothes and instruments to the narrow end of the pole, took the plate of food, and accompanied her son to the hitching post, where they lashed the pole tightly like a flagpole so that the sacred belongings of Chief American Horse waved high in the night sky. She laid the plate of food at the base of the pole as an offering to the chief’s spirit. They stood together in the dark while Laura spoke in Lakota to Chief American Horse. The next day the sacred bundle belonged to Eugene for life. A decade later Eugene still had the dancing clothes of Chief American Horse while living among the Osage in Oklahoma. He was starting to drink heavily, and his marriage was having problems, so he moved in with Louis Shangreaux, another Lakota man married to an Osage woman. Louis was an expert horse rider. Before his marriage, while he was still living in South Dakota, “Louis Shangreaux was a champion bronc rider, one of the few cowboys who had ever been able to ride the wild horse Midnight, and the only one ever to make a clean ride on Tipperary,” Eugene told me later. While Midnight is probably the most famous bucking horse in rodeo history, Tipperary was the most successful at tossing his riders… rippling his skin and twisting his body in ways that almost seemed supernatural. In the 1920s and 30s, despite efforts to organize the sport, many “world championship” rodeos were held in the western states, so there were many rodeo champs. As the sport professionalized, “working cowboys” from ranches were excluded, so there were many expert bronc-riders whose names got lost in history. I can’t find any record of Louis Shangreaux successfully riding the famous Tipperary, so I’m not sure if Eugene’s claim is a little known fact or a local (Pine Ridge) legend. Whatever the case, I suspect that Louis is one of history’s forgotten heroes. 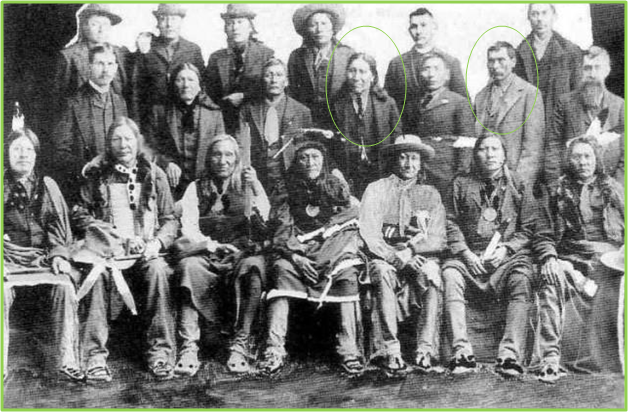 I was able to find (at the Denver Public Library) an old photo that includes both American Horse #2 and a Louis Shangreaux, taken during an 1891 Lakota delegation to the nation’s capital… but that Louis Shangreaux might have been too old to be a top bronc rider 20 to 30 years later (Tipperary was knocking off cowboys from 1910 to 1930). Eugene told me that one thing Louis enjoyed as much as bronc riding was playing poker. One Monday Eugene went to Tulsa on business when Louis hosted one of his week-long poker games. By mid-week Louis had lost all of his ready cash and some of his personal belongings. He rummaged through Eugene’s stuff and found the sacred bundle of dancing clothes and instruments… which he took to a pawn shop for poker money. When Eugene returned home and found out, he was aghast. Even though it was Louis’s doing, Eugene felt personally responsible for dishonoring the spirit of Chief American Horse. He rushed to the pawn shop and bought back the dancing clothes, but as he searched through the bundle he discovered the sacred eagle-bone whistle was missing. The store owner said he’d sold it to a young Osage lawyer named McKenzie, who collected artifacts. Eugene called McKenzie, who wasn’t willing to part with the priceless item, so Eugene was powerless. The whistle, it turned out, was not. The old folks had warned Eugene that the eagle bone whistle was a powerful instrument as long as the spirit of the chief felt a connection to it. Within a week, the pawn shop owner took his mother out for a drive in the country and had a serious accident. He was sent to the hospital; she was killed. A while later, attorney McKenzie was riding horseback across his ranch when his horse spooked, threw the lawyer to the ground on his back, then fell on his chest. It was two days before he was found with a broken back on the brink of death. Sylvester Tinker, who would later became principal chief of the Osage tribe, heard about the whistle and its power. He bought it from the lawyer, and before long he and his wife were involved in a serious traffic accident that sent her to the hospital. She emerged with a scar across her throat from ear to ear. Chief Tinker contacted Eugene. He said he’d wrapped the whistle tightly in a rag and stuffed it into a hollow clothesline pole. He didn’t want it around his house. He told Eugene to come and get it at his earliest convenience before it did any more damage. When Eugene arrived at the Tinker home he found the small bundle solidly lodged in the clothesline pole. It wouldn’t budge. He worked at it carefully for the better part of an hour until it finally gave way. He unwrapped the rag and found the whistle broken into tiny pieces. From what Eugene told me 40 years ago, and from my afterlife research over the past 30 years, I deduce that Chief American Horse might have been a restless spirit for a while after his death, and he certainly seemed to be an imposing spirit with a powerful will… like the man he’d been during lifetime. So, do you suppose Chief American Horse and other Native Americans of noble bearing, now in spirit, have migrated with their people to be closer to Timestream to find greater peace and happiness? I wouldn’t be surprised. I kind of hope so. Here on Earth, meanwhile, noble-savage living continues. Joe American Horse told me recently that he is sad about an incident that happened in Arizona a few years back. A motivational speaker charged people thousands of dollars each to participate in a retreat that included a poorly planned sweat lodge (a traditional Lakota ceremony for spiritual purification). The participants became dehydrated and overheated during the ceremony, and three of them died… adding to the many fears and misconceptions in American society about the noble spiritual beliefs and practices of Native Americans.